Description: This Drawstring Purse is unique in the fact that it has picots (loops) along the top. A cord is passed through them and pulled to form the closure. 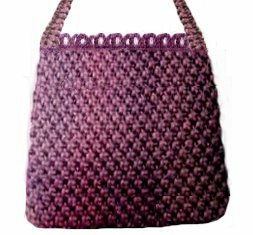 This is an easy Macrame pattern, suitable for beginners. The finished handbag design is approximately 10 inches wide and 12 inches long, and has a 32-inch strap. Note: The image above shows the purse without the drawstring, in the open position. With the drawstring pulled tight, the top opening will be narrower. Treat the ends of all the cords in some manner to prevent unraveling. See Cord Preparation for more details. Step 1: Secure the center of the four strap cords to your board, arranged side-by-side so they are vertical. The 7-yard cords should be placed between the 9-yard cords. Step 2: Mentally number the cords 1 - 4. 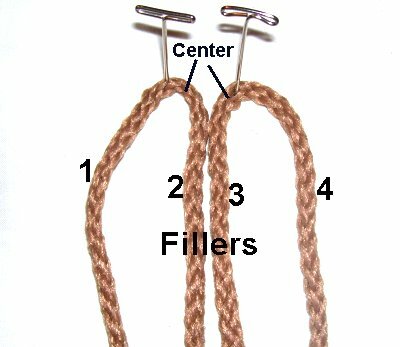 Tie the Alternating Half Hitches using cords 1 + 4, which are the working cords (9 yards). The Half Hitches are attached to cords 2 and 3, which are holding cords (7-yards). Start the knots at the center, and work towards one end. Tie enough Half Hitches to make a 16-inch design. You can make the strap longer if you have enough material left. Measure all four cords, and make sure you stop when they are 55 inches long. Finish with a Square Knot when the first half of the strap is the size you need. Turn the strap around, and re-secure it to your board. Tie the second half the same way, stopping at 16 inches (or the same size as the first half). Tie a Square Knot to complete the sennit. Make sure you have at least 55 inches left if you decided to make the strap longer. Step 3: To make the Picot Designs for the Drawstring Purse, fold 2 of the 3-yard cords in half. Lay them on your table so they are next to each other. Secure them at the center with a pin or tape, and mentally number the segments 1 - 4. 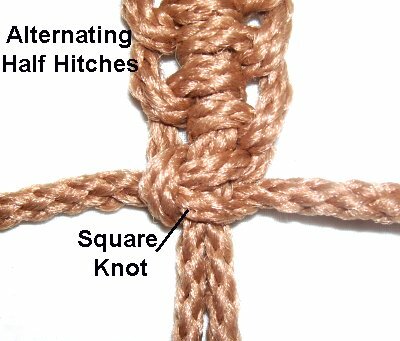 Tie a tight Square Knot 1/2-inch below the fold, using segments 1 and 4 as the working cords. The fillers are segments 2 and 3. 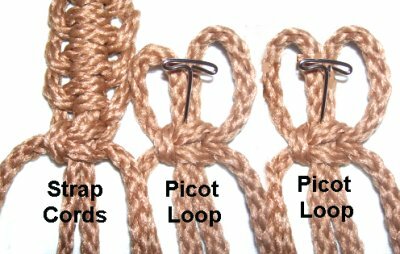 Do not remove the picot loops above the Square Knot, since they are used for the closure. Step 4: Repeat step 3, creating 15 more picot designs (total of 16). 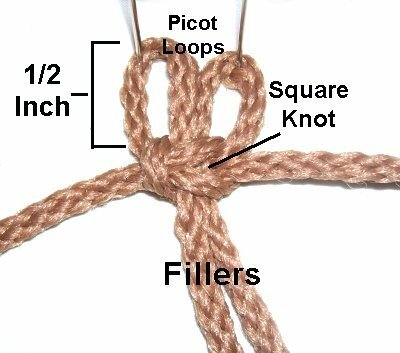 The last Square knot at each end of the strap should line up with the Square knots in the picot designs. Make sure the strap is not twisted before moving on to the next step. Mentally number the cords 1 through 40, moving left to right. Tie one row of ASK, using cords 3 - 38 only. Do not use the 2 cords at each end (1, 2, 39, and 40). Apply a small piece of tape to mark them, so you can locate them easily. Step 6: For the back half of the Drawstring Purse, arrange the remaining Picot Designs on your work surface (8), arranged horizontally. Mentally number the cords 1 through 40. Tie a row of ASK using cords 3 - 38. Add the tape to cords 1, 2, 39, and 40. Step 7: Place the two halves of the purse together, with the front on top of the back (insides touching). Make sure the rows of Square Knots on each half are lined up. Tie a Square knot using the four marked cords, at each side of the purse. Step 8: Tie rows of ASK using all the cords, moving around the entire Drawstring Purse, front to back. It helps to hang it up by the strap while working on it. Make sure the rows are close together. Stop when the purse is 10 - 12 inches from top to bottom, or you are satisfied with the depth. Design Tip: To decorate this handbag, add small beads or buttons to some of the cords as you progress. Small charms and shells look really nice, too. Important: Make sure you have at least 20 inches of material for the last 4 rows and to close the bottom. Step 9: To make the bottom more rounded, tie 4 rows of ASK while dropping 4 cords at each edge, at the start of each new row. When you drop the cords, you push them to the inside. Tie the remaining knots across the gap, tightening them firmly. It's best to drop the cords coming from 2 complete knots near the right and left sides, rather than choosing them randomly. Step 10: Turn the Drawstring Purse inside out, so you have access to the inside bottom area. 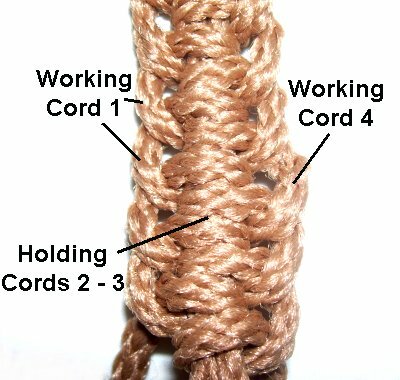 Select one cord from the front and back, and tie a tight Overhand knot. Make it as tight as you can, and apply glue. Trim the cords shorter so you know they've been used. Repeat with the other cords. When the bottom is closed, trim the cords to 2 inches and either weave them into the spaces in the bottom, or unravel and fluff them. Step 11: Turn the handbag so the ends are on the inside. To make the drawstring closure, weave the 36-inch cord through the picot loops along the top edge. Start in the center of the front half and go all the way around the handbag. This way the ends will meet in the front. Adjust the cord so the ends are even. Trim the cord if necessary. Pass the two ends through a bead, heading into the opening in opposite directions. When you pull on the ends, the bead slides up and secures the closure. To keep the ends from sliding out of the bead, tie Barrel knots at the tips. Have any comments about the Drawstring Purse? Contact Me.